Based on the bestseller which is available in many different versions like MonoBlade, MonoShock, DuoShock, low or high aero rims, ETRTO 406 or ETRTO 451 sizing, in Cr-Mo of titanium. Now a new type is added: with 26 inch / ETRTO 559 wheels, the most standard type of wheel diameter and tyre in the world. The head angle has remained the same, but by applying the 26 inch wheels the wheelbase has increased with 6 cm (2.5 inch) to 119 cm (53 inch). Together with the larger gyroscopic effect and the 25% increased wheel size this has led to a magnificent road behaviour and an even smaller rolling resistance. The seat height is increased by 6 cm, resulting in a seat height of 48 cm. This means the bike is still easy to mount. The bike is suitable for riders with an inner leg length from 80 cm. The seat angle is as usual adjustable and can be varied from 21 to 28 degrees by using different lengths of suspension elements. The head angle can be adjusted from 69 to 73,5 degrees. 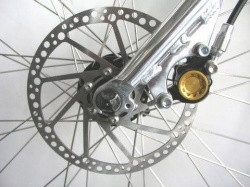 M5 SP 559 is also available with a Cr-Mo fork with disc brake braze-on. Coating dubbele metallic powder coating with transparent top coating, several colours available. Optional Tail Bag for Shock Proof, 65 litre luggage space. See small picture above and the M5 Carbon Specials.